I'm beginning a work based blog at http://cainscrimgeour.wordpress.com , giving a behind the screens look at some of the projects I get involved with, with the thoughts and ideas that they create. Here's my first post from earlier in the week. For the past two days I’ve been privileged to spend some time working with Chris Harman, from The Den Building Experiment, as part of English Heritage’s ‘Unleashing the Wild Side of Belsay’, producing a promotional film for future events. Chris is the first person I’ve met whose title reads, ‘The Den Builder’, and the first person I’ve ever heard of whose profession is building dens. When I first met Chris back in February I couldn’t get past the thought of how sad it was that his job had to exist. It took me back to my school Summer Holidays, where almost everyday, from dusk till dawn, was spent buildings dens, making fires and exploring our small patches of woods. I was under no illusion that few kids build dens, or even spend time in the woods in this ‘modern’ age, so much so that just last week when I spotted a little lean-to den in the woods, it brought a huge smile to my face. ‘We believe that the experiences of den building is fundamental to children’s development, allowing them to learn through play and exploration. Despite the proven value of den building activities, research suggests that it is dying out. Through engaging and inspiring people, our aim is to preserve the art of den building, providing opportunities to learn a broad range of skills, including team work, problem solving, mathematical skills and creativity’. Not only is Chris inspiring the younger generations, but he’s also re-inspiring the older ones too. Today we’ve had the weather on our side, blue sky and a lovely warm sun, in the beautiful Quarry Gardens of Belsay Hall. 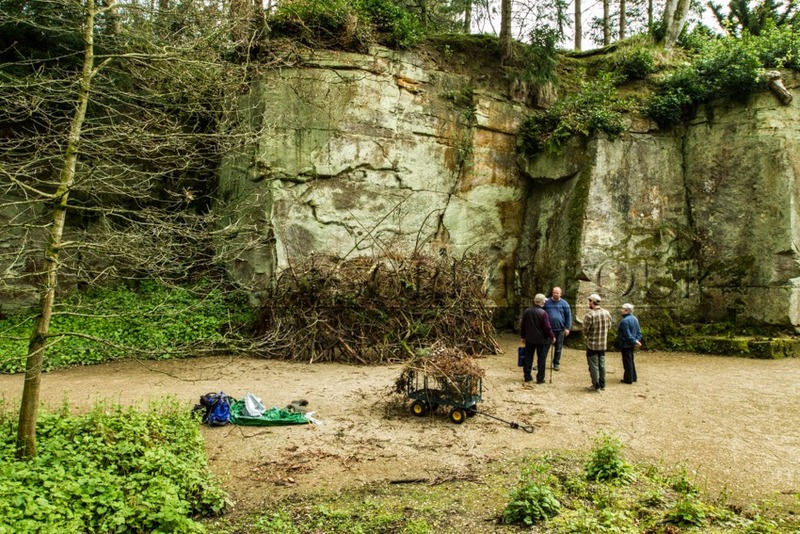 Its attracted a variety of people out, from young to old, very few walked past without engaging in conservation about the Belsay Wildman, the Den itself, but mainly (from the older generations) reminisces of there childhood dens. You could see their eyes light up as they recounted their experiences, digging underground dens with roofs of corrugated iron, cooking on metholated spirits and fires, every little detail describe as if it was yesterday. Dens had obviously played an important, and happy part of their lives. When was the last time you seen children in the woods building dens? Childhood is now mainly an indoor, structured lifestyle, with very few ‘wild’ children kicking about. I feel that its important not to forget about the older generations, mainly parents, when you talk about inspiring children, as they are the main part of the problem, along with schools, public perception and the police. On Easter Sunday an article was published in the Chronicle, titled ‘Mum hits out after police called to deal with children building a den in Warkworth Woods’. Taking the article with a pinch of salt, the main problems still ring true, local residents complained (public perception) and the police responded telling the children to dismantle the den and ‘leave the woods’. I was in a similar situation a few times when I was kid, once being put in the back of a riot van, suspected of taking drugs when I was out looking for a Sparrowhawk nest, and told to ‘not go in the woods again’, thankfully I didn’t listen, but where would I be if I had? The lack of kids outdoors isn’t a recent trait, it’s been slowly building over the years and has been heavily documented in America by authors such as Richard Louv. William J Long spotted the trend back in 1903! Despite this, I feel trends are changing, thanks to a number of organisations and individuals making a difference. Children are starting to become wild again. Unleashing the Wild Side of Belsay will be running all Summer, inspired by the story of the Wild Man, the Middleton’s protector for over 600 years, an uncivilized, hairy and strong being that live in the forest and mountain wildernesses on the edge of civilised society. By the 17th century it is said that the Wildman had come to be seen as a noble savage, protecting civilised society. Changing the perception of the wilderness from frightening to celebrated. Chris will be back for ‘Wild Week at Belsay’ from Sat 24th May- Sunday 1st June, helping (and inspiring) children build their very own Wildman Dens. I was recently reminded of my own childhood when I was preparing an area of woodland for watching wildlife. Clearing an area to stand and branches blocking my view.